3 photos taken by Daniel in this post. Hannah and Caleb brought the big gray tub up from the barn and filled it with water to sit/play in. Of course they didn’t leave it clean for very long and were soon adding mud! Joys! When the kids got fed up with that game, the geese decided to hop in! 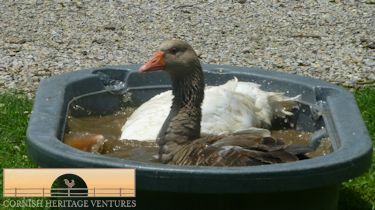 Is this true love as the gander and his girl look into each other’s eyes? Since having their goslings the geese have stayed very close to the house and barn. Before that they would go down to the big pond. 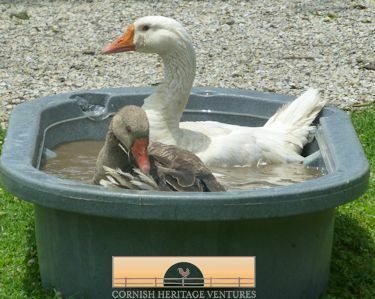 I guess they enjoyed having a good clean in a decent depth pond!